Social media plays a massive part in the recruitment process these days, it’s important that you’re involved! Get your profiles up and running as soon as possible but take your time, building each in turn, making sure that they represent you in the best way. We’ll discuss the three key networks you should be considering (in order of importance) and how they can help you in your job hunt. If you only keep one social media profile in your job hunt, LinkedIn should be it. LinkedIn is a professional network whose entire function is to connect people based on their professional experience and goals. LinkedIn’s help page on ‘Getting Started’. We talk in more detail about how to create a great LinkedIn profile in this article, but using LinkedIn is more than creating a profile and waiting for recruiters to hire you – here are 10 other ways you can utilize LinkedIn for your job hunt. Having spent so long thinking about searching – use it to your advantage and ensure that your profile is set up to best suit how people search.Include keywords (especially in your header) and pick a few key skills and focus on them – just be careful you don’t create a profile full of buzzwords that don’t actually represent you as a person or a candidate. LinkedIn lets you choose whether you are ‘visible’ as a searcher or not (i.e. when you look at someone else’s page, can they see that you’ve been looking). There’s a time for ‘anonymous’ browsing but when you’re looking at specific companies or individuals within those companies, don’t be afraid to be ‘visible’ – let these people know you’re interested in them and what they do. The other benefit of visible browsing is that it’s the only way you get to see who’s been viewing your profile. Join groups and get involved – you may see additional job listings posted within the group but you’ll also be raising your profile within the industry. Just don’t get too carried away, it’s probably better to be an active member of a smaller number of more appropriate groups than an inactive/passive member of lots of groups. Take the opportunity to get involved in conversations, ask advice and get your name recognized (for the right reasons!) within industry groups. If you’re worried that you don’t have anything interesting to say about the industry yet, share news stories and articles that other people have written. This can be great for relationship building with the author, as well as showing yourself as engaged in the industry. You should be aiming for a minimum of 50 connections. Start to build this number by adding people that you know. Spend time searching for family, friends, colleagues, ex-colleagues, acquaintances in the first instance (see LinkedIn’s help page on synching contacts). There are mixed opinions on whether to add people you don’t actually know. If you do, make sure you’re adding them for a specific reason and that you personalize the message you send to them to reflect that. For example, if you’re trying to connect with a hiring manager for a pharmaceutical company, you could tell them that you’re reskilling to work in the pharmaceutical industry, you’d love to work for their company one day and would like to connect to keep yourself up to date. If you’re not familiar, Twitter is a social network that was founded on the basis of communication via short messages (“tweets”), up to 140 characters. Twitter’s help page on ‘Getting Started’. If you’ve only used Twitter socially before, you might be surprised to learn it’s becoming increasingly popular as a recruitment and job hunt tool. One word of warning though – you may want to create a specific job hunt Twitter profile, you don’t necessarily want potential employers seeing everything you’ve ever tweeted, and an open profile is a must when you’re job hunting. First and foremost, you can search for a company account on Twitter to check out their public persona – how are they presenting themselves and what are they talking about? Follow companies that you’re interested in – you’ll continue to see updates and some will post jobs to that feed. Some others may have specific careers twitter accounts, so be sure to search for the company name and ‘careers’ as well. Follow industry professionals as well as companies – in their tweets, you’ll likely find links to news stories and articles, you’ll start to get a better sense of what’s happening within the sector. Find them by searching for “pharmaceutical” or “medical devices”, and take it from there. Once you’ve followed a few accounts, Twitter will start to suggest similar accounts to you, these are worth a look. You can use Twitter to research individuals as well, this might be particularly useful when you start to get interviews. You might be able to get additional insight into an interviewer through their tweets, what articles are they linking to? What industry issues are they talking about? Speed things up by saving your useful searches and use the list feature to keep accounts posting jobs separate in a feed from industry news so you don’t miss them. Make the most of the # feature – you can search for job hunt related topics, industry chats or your local area to find people talking about relevant topics and gain useful information. Facebook’s help page on ‘Getting Started’. The real value of Facebook to a job hunt is to check out companies – spend some time on a company’s page to get a sense of their goals, their tone, their values and their attitudes. “Like” company pages that you’re interested in – you’ll see their postings. Communicate and engage with them. It’s highly unlikely that the person running their Facebook page will be interviewing you but it all helps in understanding and connecting with them as a company. If you’re not currently in employment, don’t be afraid to publicise that you’re looking for a job, and what sort of role you’re looking for. Let your friends know what you’re doing and what they can do to help – these are the people who should most want to help you. Ask them if they know anyone in similar roles or working for particular companies, for example. People can’t help if they don’t know what you need! The main point about Facebook though, is that if you used it prior to this, make sure your privacy settings keep everything private. Recruiters and hiring managers do search for prospective employees on Facebook – that’s not an urban myth – and they can (and have!) decided against hiring people based on what they find there. 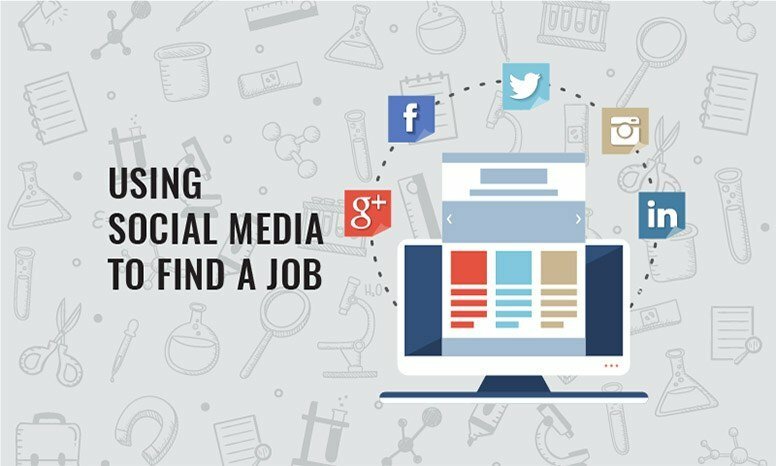 This is one of the biggest benefits of using social media in your job hunt but it can also be a huge drawback. It’s up to you to be disciplined in what you post and how you control your privacy settings to make sure this isn’t an issue. Be sure to check out our article on managing your online reputation. In addition to risking turning potential employers away, if you’re job hunting while already in employment you need to be extremely careful with your settings and what you publish so you don’t jeopardize the role you’re already in. The other big drawback of social media is the potential for it to drain your time. It’s undoubtedly a big asset to today’s job hunting environment but it’s far from the only thing you should be doing. It’s extremely easy to make yourself busy without achieving much on social media. Plan your social media time well and stick to time limits. Have a clear plan on what you’re looking to achieve for that day and try not to deviate too far from that. Whichever social network(s) you decide to use to help you in your job search, be consistent across them all. You should adapt the specific content to suit the network but the tone and facts should present a consistent message about you as a job hunter. Once you’ve spent all that time developing your social network profiles – keep at it! The nature of these sites mean things change all the time, keep an eye on them. Set aside an amount of time for this and don’t fall into the trap of doing nothing but this – social networks can, and will, drain your time. What You Should Do Next!